Knowing that you carry a pill-sensitive little person inside you may be just the motivator you need to lower your dependence on medications. I always encourage my patients to develop a pills-skills mindset. Rather than asking “What can I take?” ask yourself and your doctor “What can I do?” If you are focused on using self-help skills instead of pills, have a conversation with your doctor about steps you can start taking to reduce your pill dependency. 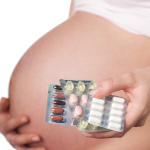 Don’t stop taking a prescription medication without first talking to your doctor regarding taking pills while pregnant. While recent research links taking pills while pregnant that mellow your mood, such as selective serotonin reuptake inhibitors (SSRIs), during pregnancy with increased rates of birth defects, the science is a bit conflicting. There seems to be a slight correlation between SSRI use in mothers and heart defects in babies, though it’s very low: 0.9 percent in women who took an SSRI compared with 0.5 percent of women who didn’t. It was also found that newborns who are exposed to SSRIs while in the womb may experience a temporary withdrawal-like effect, including low blood sugar, unstable body temperature and irritability. Taking pills while pregnant like these require the “when in doubt, leave them out” classification, unless you have tried all alternatives and your fragile mental health jeopardizes your healthy pregnancy and healthy baby. Be sure to consult with your healthcare practitioner. Your baby’s growing body and brain – as well as yours – need extra cholesterol. Cholesterol is one of the top brain fats in growing your little “fathead,” and you need additional cholesterol to make the pregnancy-maintaining hormones progesterone and estrogen. The good news is that except in the case of a rare genetic quirk called familial hypercholesterolemia, the skills of diet and exercise we recommend will usually work as well as and much more safely than the pills to keep your cholesterol at a healthy level. This drug has not been proven safe. Don’t use it while pregnant. While a few occasional doses of Ibuprofen (Motrin, Advil, Nuprin) or Aspirin are unlikely to harm your baby, taking pills while pregnant like these for prolonged periods requires medical supervision. Both Ibuprofen and Aspirin can interfere with prostaglandins, the natural labor inducing hormones. Also, because of its prostaglandin-lowering effect, prolonged use of Ibuprofen could theoretically interfere with normal blood flow in the baby’s blood vessels. Prostaglandins regulate widening and narrowing of blood vessels. Aspirin is an anticoagulant and theoretically can cause bleeding. Acetaminophen (Tylenol) is considered the safest analgesic. If taken in the standard dose for only two to three consecutive days, it gets the green light. For additional resources on using medication during pregnancy see Medications and Mothers Milk 2012 by Thomas Hale or Drugs in Pregnancy and Lactation by Gerald Briggs, Roger Freeman, and Sumner Yaffe.